Dragon blood and scales, dragon liver and eyes and teeth. All required ingredients for medicines with near-miraculous healing powers. The legendary blue dragon Tintaglia is dying of wounds inflicted by hunters sent by the Duke of Chalced, who meanwhile preserves his dwindling life by consuming the blood of the dragon's poet Selden Vestrit. If Tintaglia perishes, her ancestral memories will die with her. And the dragons in the ancient city of Kelsingra will lose the secret knowledge they need to survive. Their keepers immerse themselves in the dangerously addictive memory-stone records of the city in the hope of recovering the Elderling magic that once allowed humans and dragons to co-exist. In doing so they risk losing their own identities, even their lives. And danger threatens from beyond the city, too. 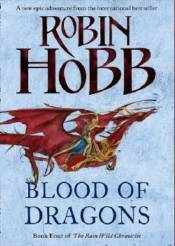 For war is coming: war between dragonkind and those who would destroy them.